The dealer had already isolated my erratic idling (750-1800rpm when warm), so instead of paying the two hours labor for the dealer to replace my IAA unit, I decided to try my luck and found out it wasn't as hard as I thought. The IAA is made up of the IACV-AAC (Idle Air Control Valve - Auxiliary Air Control) valve, the idle adjust screw, and the IACV-FICD solenoid. Fortunately you don't have to remember all this because it comes in one unit. The IAA controls idle and compensates for cold engine starts and pressure changes. Work was performed on (& corresponding part numbers are for) a 1993 Twin Turbo. As required. 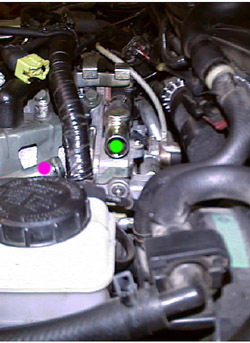 When idling becomes erratic and can no longer be adjusted using the idle adjusting screw. 1. Look at the new AAC valve assembly (1.). There are 9 features you need to familiarize yourself with. 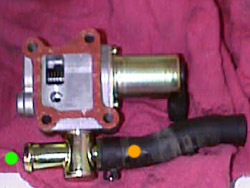 The two hose attachments, the two electrical connections, the four bolt through holes, and idle adjusting screw. 2. Open the hood and drape a blanket or towel over the driver's side quarter-panel to prevent scratches to the paint. 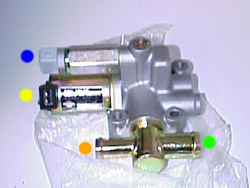 The Idle Air Adjusting (IAA) Unit is located on the driver's side just behind the manifold and just inboard of the master brake cylinder (2.). The idle adjust screw is most easily visible. 3. Start removing air hoses one at a time to gain access to the IAA unit. You may need to unplug the plug wire going to the back cylinder and there is a ground bolt that may need to be undone to ease access. 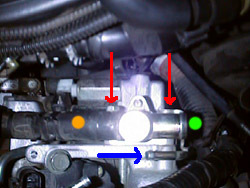 Once you get down the unit, remove the short hose between the IAA unit and the tube between the master brake cylinder and the manifold (3.). Zip ties may be useful to hold hoses and wires back out of the way. 4. 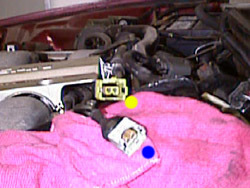 Reach down and unplug the two electrical connections attached to the IACV-AAC valve (black male connector, yellow female connector) and the solenoid (light blue connectors). These connectors have wire retention clips which do not need to be removed. A little bit and patience and gentle prying with a screwdriver will get these out eventually. 5. Once the electrical connections are removed, all that's left is one hose and 4 bolts. The red arrows (4.) show the two top bolts that are easy to get to with a 3/8" socket wrench with a 10mm socket. There are two other bolts below that require a little more coercing to get out. You may need to change to a smaller 1/4" socket wrench also with a 10mm socket. 6. The blue arrow (4.) is a tube that needs be ben back towards the driver's side once the top bolts are removed. I had no issues bending this, just be gentle. 7. Once all bolts are removed, pull the unit out and the last hose should work itself free. 8. Take the old part and compare it against the new part (5.). There should be no physical difference. 9. Pull out the new gasket and apply a light coat of grease to both sides. This will allow it to adhere to the IAA unit during installation (6.). Put the gasket on the IAA unit and attach the short straight hose to the unit. 10. Before reinstallation, take an opportunity to clean the solenoid and the IACV-AAC connectors (7.). I use WD40 and a small paintbrush. Make sure the connectors are completely dry before reattached. 11. Reassemble in reverse order. Put all four bolts in fingertight before using a socket wrench to tighten them. Make sure that the gasket is still aligned during installation. 12. Once all hoses, wires, and bolts are back in place, remove all rags and tools from the engine bay. Start the car and let it get warm (a short drive perhaps). 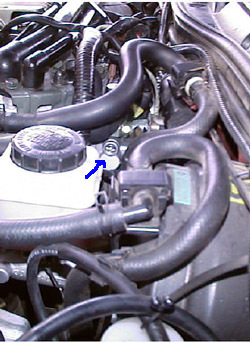 Upon return, open the hood and turn the idle adjusting screw counterclockwise to increase idle, clockwise to reduce idle. Z's with manual transmissions (TT or NA) should idle at 700 +/- 50 rpm. Automatics should idle 50-70 rpm higher when put in neutral. The engine will tend to idle no lower that 700 rpm, so I would suggest turning the screw counterclockwise until the rpms just slight start to rise.